Building upon the foundation in military formations and marching laid down at freshman orientation, new Midshipman are required to participate in the Basic Drill Team for the Fall Semester. Led by dedicated upperclassmen, the team practices multiple times per week. 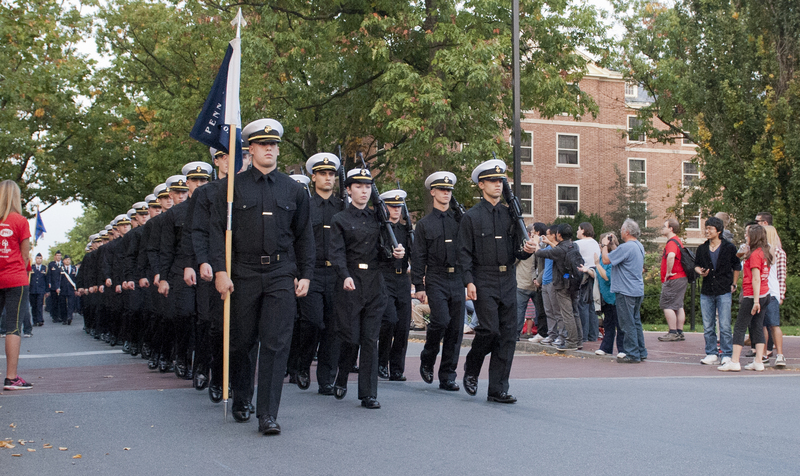 In the Fall, the teams practices for marching in the Homecoming Parade as proud, locked-on representatives of the Naval ROTC Battalion. The work is hard, and the payoff only mental, but the teamwork and dedication required are their own reward. In the Spring, members prepare to compete in a number of Military Excellence Competitions (MECs) against other Midshipmen from across the country. The team has a record of excellence and never ceases to make Penn State NROTC proud.